Arlington County is thrilled to welcome Gerber Products Company, subsidiary of Nestlé S.A. to its community as a new leader in the business market. Virginia Governor Ralph Northam made the announcement this afternoon that Nestlé will invest an additional $5 million to relocate Gerber from New Jersey to join its corporate headquarters in Arlington’s Rosslyn neighborhood. Gerber is expected to occupy 23,392 square feet of office space in Rosslyn’s 1812 North Moore address, creating a total of 150 new jobs. 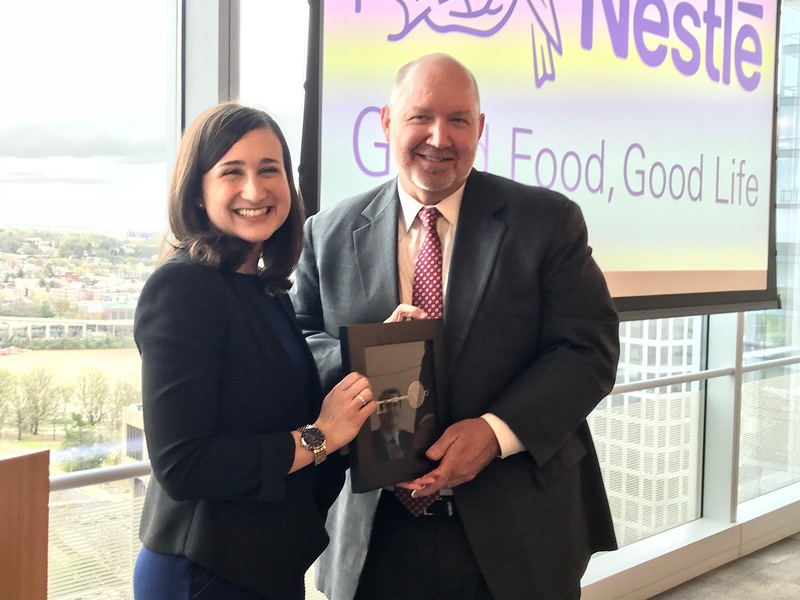 Arlington County Board Chair Katie Cristol with Nestlé USA CEO Steve Presley at the announcement on April 16. Today’s news brings Nestlé’s total occupied office footprint in 1812 North Moore to 252,000 square feet, which is 47,000 more than when the company first announced its relocation last year. Nestlé signed a 15-year lease for 196,000 square feet (plus additional 9,000 SF of retail/lobby) in February 2017 and has now added three more floors of the building to its original occupancy footprint. Nestlé’s decision to bring one of its top brands to Arlington after choosing just a year ago to locate its headquarters here is a major step forward in Arlington’s effort to diversify its economy. Once known as a government suburb, Arlington has taken a concentrated effort in recent years to attract new and different companies to Arlington, specifically those associated with the innovation economy and with a global scope. The Virginia Economic Development Partnership worked with Arlington County Economic Development to secure the project for Virginia. Governor Northam approved a grant in the amount of $862,500 from the Commonwealth’s Opportunity Fund to assist the County with the project, which Arlington County will match in local infrastructure improvements. The company is also eligible to receive a Major Business Facility Job Tax Credit. Funding and services to support the company’s employee training activities will be provided through the Virginia Jobs Investment Program. Arlington County is expected to receive an estimated $4.2 million in net new revenue over a 15-year period as a result of the deal.